I recently rediscovered this picture again. It disappears into the depths of my computer for a while and then I rediscover it and it makes my day every. single. time. That is my mom. 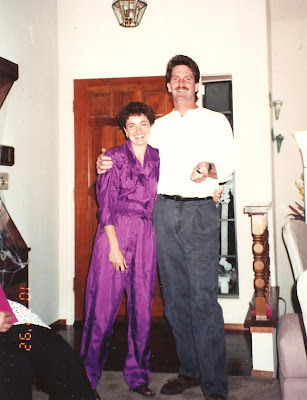 Wearing a shiny purple jumpsuit. And my dad. Wearing a mustache and hair that is venturing forth into quasi mullet territory. This is an epic photo. there is nothing not to love about this. boy howdy! P.S. That was my surprise 30th birthday party.